Written to provide students with the critical tools used in today’s development economics research and practice, Essentials of Development Economics represents an alternative approach to traditional textbooks on the subject. Compact and less expensive than other textbooks for undergraduate development economics courses, Essentials of Development Economics offers a broad overview of key topics and methods in the field. Its fourteen easy-to-read chapters introduce cutting-edge research and present best practices and state-of-the-art methods. Each chapter concludes with an embedded QR code that connects readers to ancillary audiovisual materials and supplemental readings on a website curated by the authors. By mastering the material in this book, students will have the conceptual grounding needed to move on to higher-level development economics courses. J. Edward Taylor is Professor of Agricultural and Resource Economics and Director of the Rural Economies of the Americas Program (REAP) at the University of California, Davis. He was coeditor of the American Journal of Agricultural Economics and has written extensively on the economy-wide impacts of agricultural and development policies. His publications include Beyond Experiments in Development Economics: Local Economy-wide Impact Evaluation; Village Economies: The Design, Estimation, and Use of Villagewide Economic Models; and Worlds in Motion: Understanding International Migration at the End of the Millennium. Listed in Who's Who in Economics, he has advised a number of foreign governments and international development agencies on matters related to economic development. His development economics work spans four continents. Travis J. Lybbert is Associate Professor of Agricultural and Resource Economics at the University of California, Davis. He has published research in applied microeconomics on topics ranging from poverty dynamics, climate change, and childhood nutrition to technology adoption, intellectual property, and innovation policy. As a collaborator with students and other researchers, he has lived and worked on projects in India and many countries in sub-Saharan Africa, North Africa, and Europe. 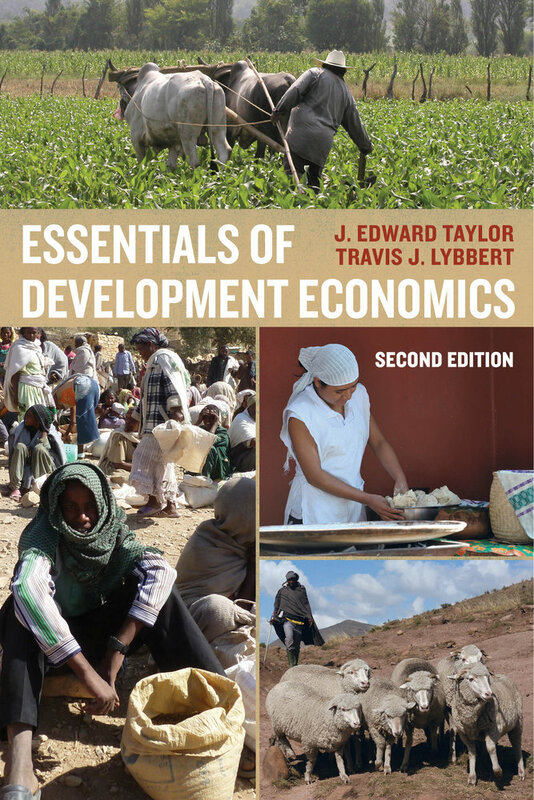 "Essentials of Development Economics emphasizes the substantive over the technical, presenting a broad overview of key topics in language that is accessible to students who have a limited background in economics and mathematics. I have been looking for a book like this for years." "The strength of this book is that it takes old, recent, and new topics and combines them into a very concise reader that is informative and interesting. Other books are too big, too old, or too dry. This book is none of these. It's extremely student-friendly." —Edward Miguel, Oxfam Professor in Environmental and Resource Economics, University of California, Berkeley, and author of Africa’s Turn? 2. What Works and What Doesn’t?